Of the four main Alien films, it's James Cameron’s action packed 1986 movie Aliens that provides the most explosive source material for a video game conversion. Konami knew this when it picked up the licence and released a fun arcade game, enabling players to blast pink xenomorphs in 1990. SEGA fans have already dabbled in the Alien franchise, not just with 1993 light gun arcade game Alien³: The Gun but with Probe’s Alien³ Mega Drive game a year earlier. In many respects Alien³ is the film that has been replicated with the greatest care in video game form; both the action-focused Mega Drive incarnation and the more strategic exploration flavour of the SNES game were fantastic run-and-gun adaptions of the movie license. 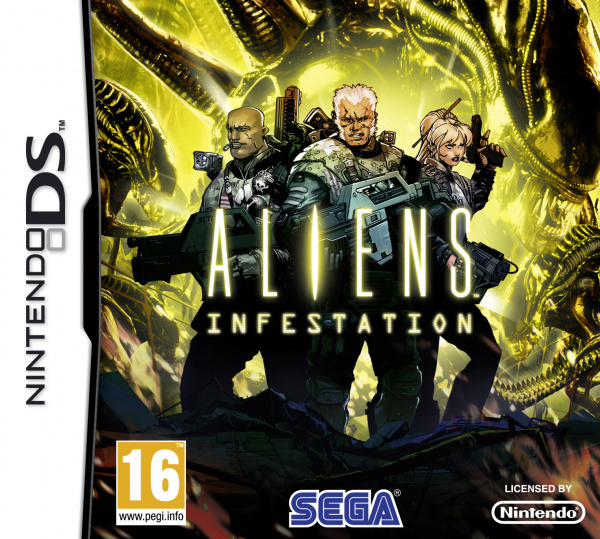 This brings us to WayForward’s DS Aliens: Infestation, a game which is openly respectful to Alien’s side-scrolling run-and-gun past. A retro embryo has been planted in this game and it wastes no time bursting out of its chest: direct links to Cameron’s movie provide a gem of a licence for WayForward and the studio enthusiastically embraces the opportunity. There is just a month period between the ending of Aliens, set in July 2179, and Alien³'s start in August of the same year. Aliens ends on the Colonial Marines warship Sulaco, and Alien³ opens with an explanation of what happened to the ship, but it's Aliens: Infestation that adds detail to events during an iconic month of sci-fi movie lore. The level of fan service in this game is huge, as you control a Fox-Six team grunt Marine led by Lieutenant Colonel Patrick Steele and investigate a distress beacon from Sulaco. What starts as a search for a missing life form turns into a xenomorphic nightmare, as you strive to prevent a disaster far worse than Hadley’s Hope. You also encounter the sinister manipulation of Weyland-Yutani, in this case represented by a sneak called Sean Davis. While the variety of environments is not the game’s strong point, this is countered by an authentic atmosphere created in exploring four locations (Sulaco, LV-426, a sharply brilliant revisit to the derelict spaceship from the first film and a research facility on Phobos). In terms of its Metroidvania gameplay and sci-fi setting, the way in which Sulaco is the focus of this game compares to the BSL Research Station in Metroid Fusion; it doesn't have the visual diversity of that game’s six habitats, but it feels similarly atmospheric to explore. Story-wise, the game succeeds on two fronts: the aforementioned fan-pleasing story setting, plus the back story and personalities of the 19 controllable Marines. You can manage a roster of four Marines at a time; each one essentially acts as a reserve of credits for when you die and you become attached to each character’s quirks, superbly portrayed in portraits by Marvel artist Chris Bachalo. For gamers that are disappointed that the Marines control the same and have the exact same abilities, it's understandable that WayForward kept the core gameplay tight, with a focus on developing skills and finding items to gradually unblock paths for progression. These are drip-fed throughout the five hour story, from key cards allowing elevator access to new items accessible from the touch screen, including a TNA lamp for dark areas and a welder for locked doors. Note that this game is not an arcade run-and-gun like Contra 4 — it echoes the movies by building tension slowly on each level and each one starts quietly, later becoming manic to amplify the scares. The increased scope of the terror is portrayed superbly through blips and audio effects on the M314 Motion Tracker, an experience which conjures memories of the screech sounds from Electric Dreams' retro C64 Aliens game. You gain confidence with new weaponry, especially as a massive M56A2 smart gun can be upgraded three times, an exoskeleton power loader crushes crates and a M240 incinerator flamethrower can double-up to burn through sticky resin doors. There's no tutorial, but the controls are accessible and intuitive from the start, and it's more a priority to determine the most effective approach to suppress the variety of enemies. There's a surprising diversity to each adversary, from Weyland-Yutani androids to the variety of Xenomorphs, although when WayForward experiments in designing its own hybrid specimen aliens they appear out of sync with HR Giger's designs. It feels rewarding to utilise a tumble roll manoeuvre technique to counter-attack a charging alien, or develop strategies against Mercenaries hiding behind crates as if they were in an ESWAT or Shinobi game. You start the game holding R to run, charging around environments, but learn to tip-toe when you are low on health. Similarly, you begin to adjust to moments of vulnerability as aliens crawl along the ceiling, or as you cannot shoot while climbing a ladder. There is also a vehicle set-piece involving an armoured personnel carrier, where you aim and control its twin 20 turret using the touch screen, but unfortunately it's very brief. 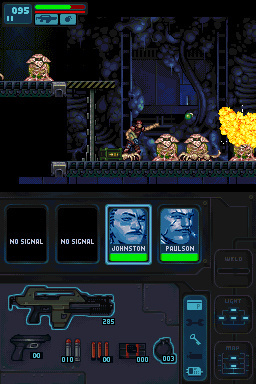 WayForward has been well praised for its pixel art mastery, yet what stands out about Aliens: Infestation is that the graphics are not just painstakingly well detailed, but they are designed to heighten the atmosphere and expand upon the gameplay. For example, the wonderful animation adds to the tension induced panic as your character slowly loads precious ammo into a M37A2 shotgun while under attack. The parallax scrolling for foreground objects or windows looking into space is consistently delightful, but it's moments like the lights going out and leaving monstrous shadows to intimidate the player that impress most. Humour is injected into the visuals to lift the tension; a random encounter with a man taking a shower and a large Total Recall inspired full body X-ray machine both add to the game’s personality. The audio work also deserves special mention, both music and sound effects are superb, adding layers to the atmosphere, twinkling alongside the stars at one moment and terrifying with creepy menacing tunes when it fits the scene. The gameplay is surprisingly linear, despite a brief Zero-G platforming section, considering its Metroidvania based design. Depending upon how much you explore, it will take a short five to six hours to complete. Halfway through the game you're rewarded with an unlockable minigame that uses the stylus to act out the android Bishop’s knife stunt. Unfortunately, you are not treated with any extras upon completing the game — the main story is so enjoyable that it would have been rewarding to return to environments in a New Game Plus, but re-runs of previous levels are not possible. There is no choice of difficulty, but the challenge is well balanced, although weapons like the unlimited ammo flamethrower make general progression easier. You will only really lose Marines during the boss battles, although these encounters are not especially memorable due to uninteresting attack patterns. The final boss is particularly disappointing, despite brilliant art design. Ultimately, regardless of whether the exploration is less sophisticated than a rival DS game like Castlevania: Dawn of Sorrow, or if the skills and abilities are not as imaginative as Metroid Fusion, Aliens: Infestation still brims with charm drawn from respect of its source material. If you are a fan of the Alien movies, relish Metroidvania exploratory gameplay and appreciate side-scrolling retro pixel art design, Aliens: Infestation delivers on all three counts. It is clear that the WayForward staff are huge fans of the franchise and 2D gaming: the mixture of dedication to fan service in the story, plus the personality of the characters complements the brilliantly detailed visuals and atmospheric audio. The confines of the source material necessitates an element of repetition for the locations and skill-based progress is not the most sophisticated of the genre, but the tension, mood and feel of this game is spot on. Just three months after WayForward surprised us with the impressive DS version of Thor: God of Thunder, it provides a second movie licensed DS swan song in Aliens: Infestation. Nice tagline from Aliens. Love these movies and can't wait to get this game. Great review J'O. Thanks for the good review. I've read a few revws of this game now and they all pretty much speak of this game highly. Not for me, but worth a punt for many I imagine. The DS isn"t going out THAT quietly y''know. I'm looking forward to this game - I'm a big fan of the Alien universe - but I'm a bit disappointed to hear it's so short and without any real unlockables. Ah well, I guess I can always replay it! I might wait for some more reviews, but I've really been looking (way)forward to this one. It would be hard to pass up a Metroid/Alien game. Nice to see that the DS is still getting a few good releases. I think I'll pick this one up soon. I might give this a go, seeing how i've enjoyed a good number of Wayforward's more recent titles (one exception being Shantae). Good review! Is it bad I've never seen a Aliens movie? XD I'll probably watch some soon and then pick this up. This is pretty fair. I loved the movie, so I really enjoyed the setting, fan-service etc. If you're not a fan of the movies though I can easily see how this would be kinda dissapointing. It's pretty linear, and feels like it shouldn't be. this game is very contra/ metroid fusion like- which is cool. nice one way forward and sega! I've been playing this game a good amount of hours the past days and trust me this is THE best WayForward 2D game EVER.. I'm a big fan of them and played games such as JL : Flash, X-Men : Official Game (both on GBA), Contra 4, Batman : The Brave And The Bold and Thor (all on DS). I do think AI is an upgrade towards those games. WFT guys are said to be read anything about them from us fans and critics so they surely listened to our complains about games like Contra and Thor. The first one was extremely harsh and punishing and the ultimate frustrating experience on a video game . Of course Konami created Contra this way but having to look at BOTH screens of the DS was extremely complicated and made the game harder than ever. you need five to 7 hits to kill a normal enemy ! it takes basically forever to kill the weakest of them and, since they're respawning, I ended up getting bored to death by it. A shame cause both games offered unique boss battles. Back to Aliens : Infestation. 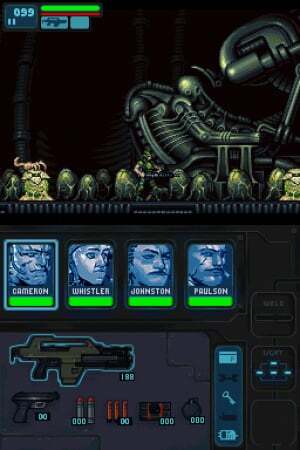 It's way more easier and less frustrating than Contra and you don't take more than two hits to kill a normal Xenomorph, face huggers or chest busters (only the androids are tougher when it comes to "normal" enemies). Good use of both D.S screens , good variety of items and weapons to use like a tank with aliens running after you and most important, exploration and a real atmosphere. It feels like the 1986 James Cameron's movie itself with those arrogant marines thinking highly of themselves and believing they're too strong and well equiped for the enemy. I love the fact each of them can die and he is gone from the play you've started , once and for all ! If you do have fave marines like me (Cameron, inspired by the real one, and Zoe the "goth chick"), you will feel a real emotionnal "connection" to them , something I've not felt in other WTF Games. The fun of not knowing who will die first and then who will take his/her place (out of a grand total of 19 marines) spices things up considerably. So far this game has gotten 8 out of 10 on 99 per cent of the sites which reviewed it (only one guy gave less, a 7 ). Trust me, it's the closest thing you will ever get to both Alien 3 (Snes/MegaDrive/Genesis) AND Metroid on the DS and current handheld generation. Well played WayForward Technologies, ending The DS life with a big bang ! Don't miss this adrenaline rush and go get it ! Haha, Apone's quote from Aliens. That was brilliant . @Corbs and @Kafei2006 Thank you kindly, as you can imagine, I had a few quotes from the films buzzing around my head when I was reviewing this game. I can't reiterate enough how well this game captures the feel of the movies, I was pumped to watch Aliens again after covering it. @El_Marko I hear you, it is relevant to point out a few quibbles in this game, for example later on in the adventure there is a mission to shut down four cooling regulators and it slows down the game's pace. However, I personally found the style, accessibility of the gameplay and WayForward's passion for the licence to combine towards a quality package overall. 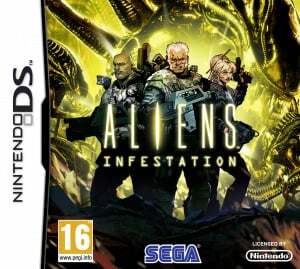 @WhiteTrashGuy I think that this game will complement Aliens: Colonial Marines superbly. Just think of Hudson's reaction to the wait for a rescue team, which has to arrive at some point ..."17 days? Hey man, I don't wanna rain on your parade, but we're not gonna last seventeen hours!" @DrWadsy Good point, although the placement of spare Marines on the final level is well considered and very fair to gamers who lose Marines during the previous boss battle. @KyleDusk Spot on about having your favourite Marines, I used the grunts that I did not like as Xenomorph fodder during boss encounters. Plus, the gung-ho hotheaded character, Samantha "Homewrecker" Johnston, reminded me of Aliens' Private Vasquez. Oorah! I can't wait to pick my copy of the game up when it finally releases here in the States. I actually canceled my preorder for Uncharted 3 for this game! WayForward has quickly become one of my favorite developers, as they keep us nostalgic types happy with their old-school gameplay styles; one that's perfectly refined to withstand today's tough standards. For those of us who anticipate each and everyone of their new games, your 8/10 review score has us running to our local game store to secure our purchase ASAP. Another awesome WayForward game? Sign me up! Hmm, WayForward and Metroidvania? It's like an angel descended from heaven- in the form of millions of game cartridges. Looks like Kirby: Mass Attack and Aliens: Infestation will be the DS's final Swang song. You just made the wait until my copy arrives much harder, Jamie. Great review Jamie, played the game for a few hours today and also think it'll make me watch the movies again. Much like Alien 3 on the Megadrive, it seems to capture the atmosphere really well. i'm waiting the delivery, play.com hurry up! Just finished the game today. I personally would give it a 9, but an 8 is still great. 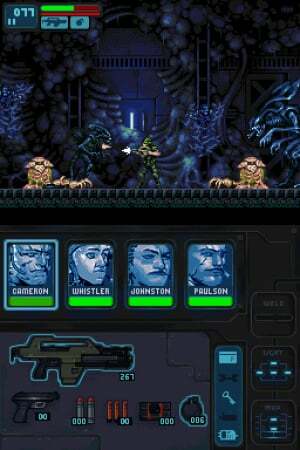 If Metroid Fusion and Super Metroid had a love child with the Aliens franchise, this would be that game. It's really engaging, and in terms of replay value, one can have a different emotional experience by losing different marines than they did first go. That has happened to me in my second playthrough already. Definitely a great way to send the DS off. I actually like this review quote a bit. It recognizes a few of the previous entries in the Alien line of games, is well written, and fair. Usually I dislike the reviews here, but this one is solid. The game itself is surprisingly good as well. I went in expecting it to be merely "ok" but in the end It turned out to be a great game. The designers really knew their fanbase when they put the Space Jockey in there too. The only noteworthy flaws with the game is that the reload system is pretty bad and renders the shotgun nearly unusuable despite it's great power, and the fact upgrades merely increase damage. I'd have preferred to see some upgrades that increase the rate of fire, clip size, etc..
Also, the knife mini game is classic. Best £7 I ever spent. I've really enjoyed Aliens: Infestation. To be honest, because of the Alien universe and the action packed 2D platforming gameplay I regard it as one of the best DS games. It offers 4 locations to discover (the Sulaco spaceship, a military base at LV-426, the ruined spaceship of the aliens and a research facility at Phobos), 5 weapons to acquire (pistol, machine gun with grenades, shotgun, flamethrower and minigun), 5 level bosses to beat, 2 special quests (operating the gun-turret of an APC-vehicle and fighting with aliens in a spacesuit in outer space) and 1 minigame (called knife trick). It took me almost 21 hours to complete the story (which is supposedly at least 5 hours long). 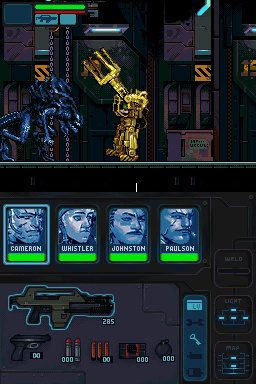 Unfortunately, there are some minor flaws (such as not random respawning of aliens, weird placement of supplies and some NPC human characters are not isolated from the hordes of aliens), but my greatest sorrow is that the game does not offer an extra option to directly replay former stages (for instance at least boss battles) and alien encounters are scarce in mounting shafts. On the other hand, I was truly impressed by the detail of the retro hand-drawn graphics, the musical score and the variety and intelligence of the aliens. I may not be getting this sometime soon, but I've played excellent side-scrollers for Metroid (Only 2: Metroid (NES) and Super Metroid). Any game with similar to my favorite game series of all time should be as awesome as Metroid. I look into this next time. But for now, Twilight Princess is next on my list.